· My 1998 Jeep TJ w/ TerraFlex lift, 1" body lift, 1" engine lift, custom CB mount, 33x12.50 BFG MTs, Centerline Hellcat Wheels, Rubicon Express Tailshaft kit, custom rear bumper, and throttle control. · My 1992 Suzuki Samurai with springover, 32x11.50 BFG MTs on 8x15 Centerline Wheels, 5.12 ring and pinions, Lock Right Lockers, custom drive shafts, custom bumpers and custom rocker panel bars. · Also, Proof that TJ's can fly. I've designed a custom CB mounting bracket that allows attaching a small frame CB to the windshield frame of a 97/98/99 TJ, (and earlier Wranglers), just above the rear view mirror. Installation utilizes the existing windshield hold down loop Torx screws and allows for hiding the antenna cable and power wires for a very clean, rigid installation. The idea for the bracket arose due to the lack of real estate inside the Wrangler for mounting any type of accessory. 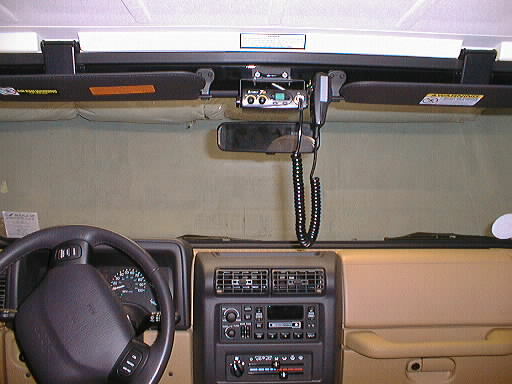 This method of mounting leaves the only other good mounting site, above the small shelf over the radio, available for other things like a GPS mounting bracket. I have installation instructions showing how to route the antenna and power wires through the windshield frame with a minimum of hassle.